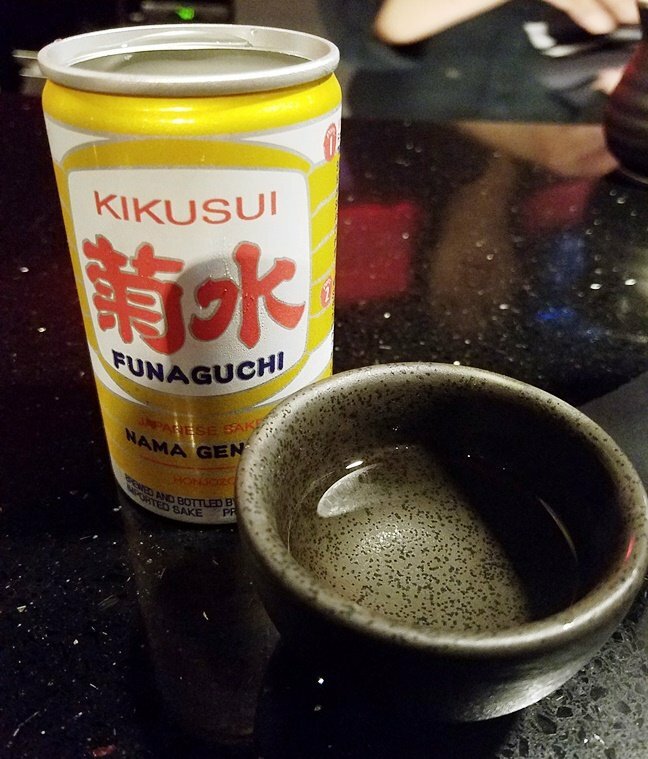 Sono Sushi, Raleigh - Refreshed and Tasting Better Than Ever! 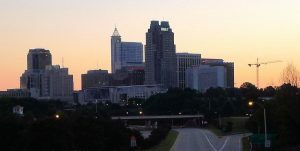 Over the years, as I’ve grown to appreciate sushi and Japanese food, one Raleigh restaurant has been consistently doing a great job for the cuisine: Sono. 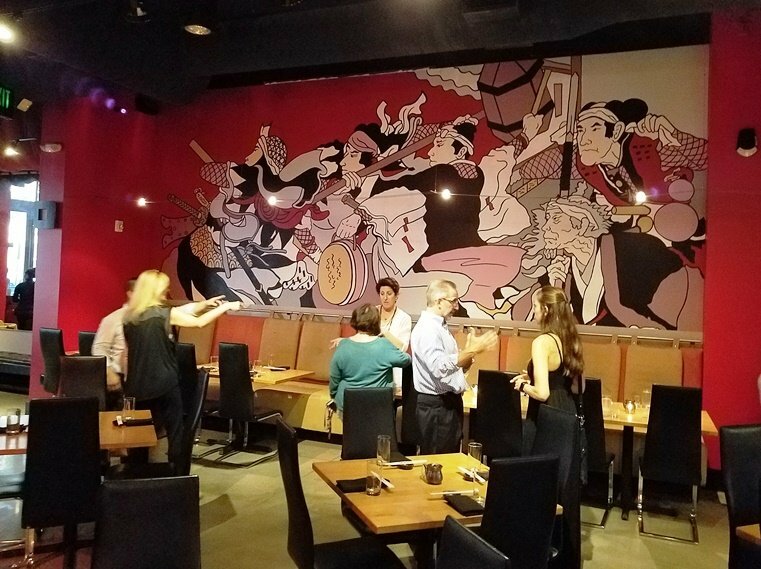 From its convenient downtown location, Sono has consistently dished out authentic and tasty Japanese eats since I’ve lived in Raleigh (nine years) and I have a tremendous amount of respect for its original owner-chef Mike Lee. So of course I was a bit concerned when I found out from Chef Mike that he would be moving on from Sono’s operations to focus on his two new concepts in Durham (M Sushi and M Kokko). What would happen to my favorite Japanese restaurant? Would it be in good hands? Well as time would tell, I had nothing to worry about and here’s why! As Chef Mike was transitioning to his Durham restaurants in 2016, I did notice some interesting changes at Sono. 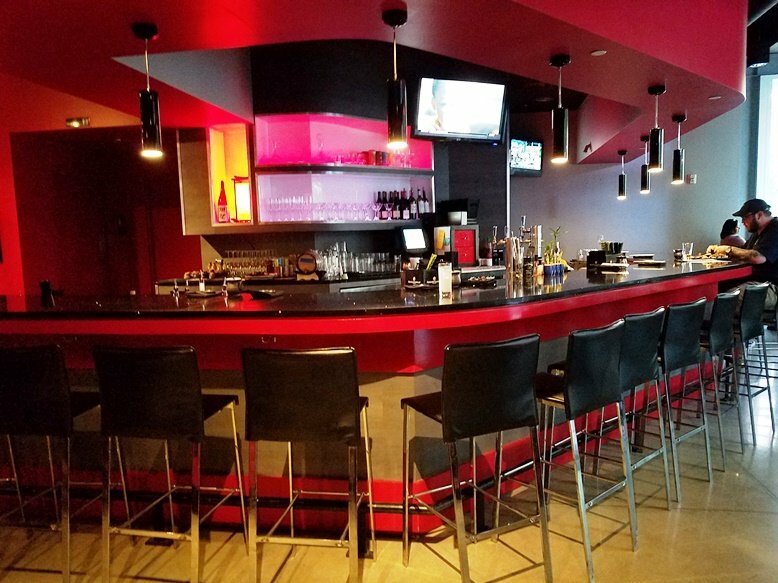 The decor was refreshed and while it still maintained its red and back motif, Sono seemed a bit newer and updated. 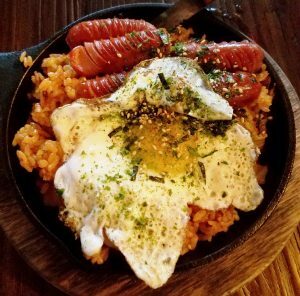 Little did I known but new Chef Hyunwoo Kim (formerly chef at An) had already taken over the kitchen and was slowly making changes in back. Eventually I did get formal notice from Sono’s PR representative, Jennifer Noble Kelly and made a concerted effort to see what had really changed during this transition and I can tell you that most everything has stayed up to the high standards that Chef Mike had initially delivered along with some new additions! Currently, Sono is doing a Sunday and Monday ramen special which I’m a huge fan of. 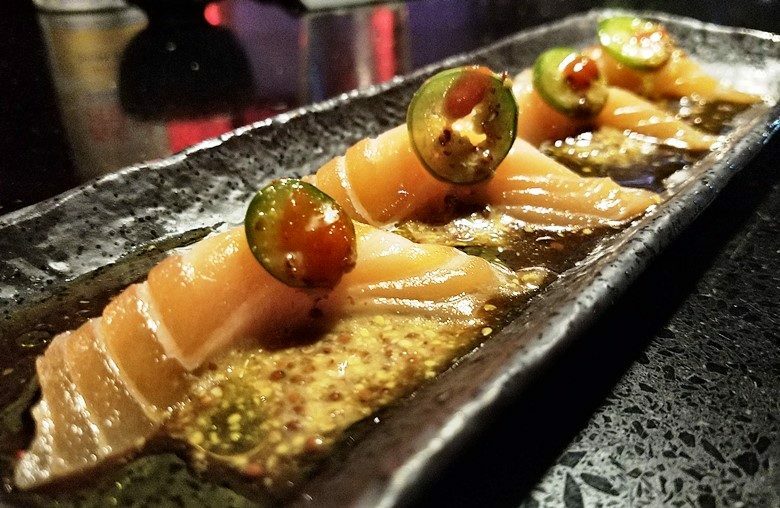 For $20, you can choose any ramen off their menu and it’s paired with a tasty starter such as crudo or gyoza The crudo I tried was a beautiful salmon topped with jalapeno and some sriracha giving the dish a bit of pop. 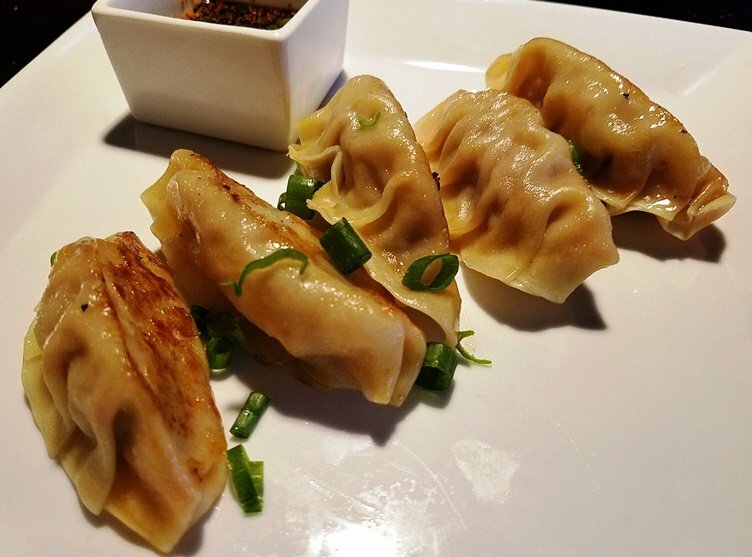 And the pan-fried dumplings-gyoza showed off a wonderfully tender skin along with a tasty minced meat filling, yum! But oh, it’s time to get excited about ramen, especially now with the weather cooling down! They’ve got several options on the menu right now (tonkotsu, shoyu, spicy miso) and the meat-focused ramens come with cha-siu pork, bamboo shoots, wood-ear mushrooms and an egg. 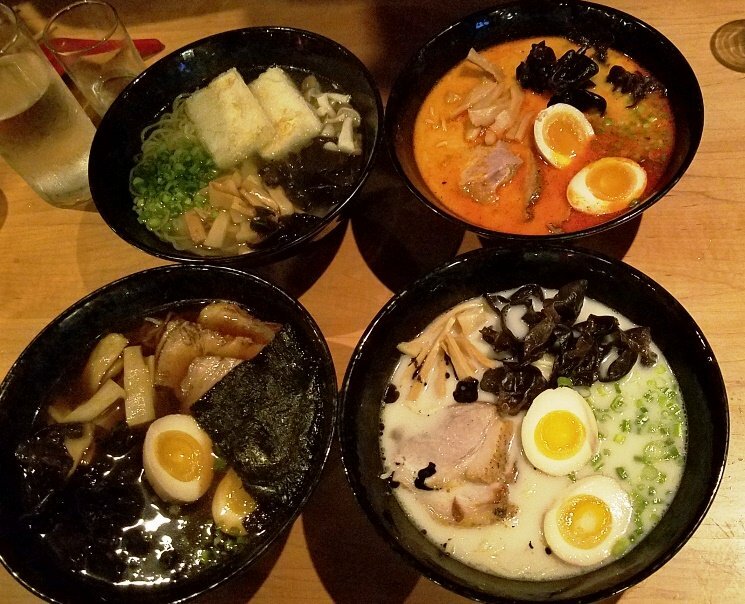 Really wonderful bowls that will fill you up, I highly recommend the tonkotsu with its milky-creamy pork broth. 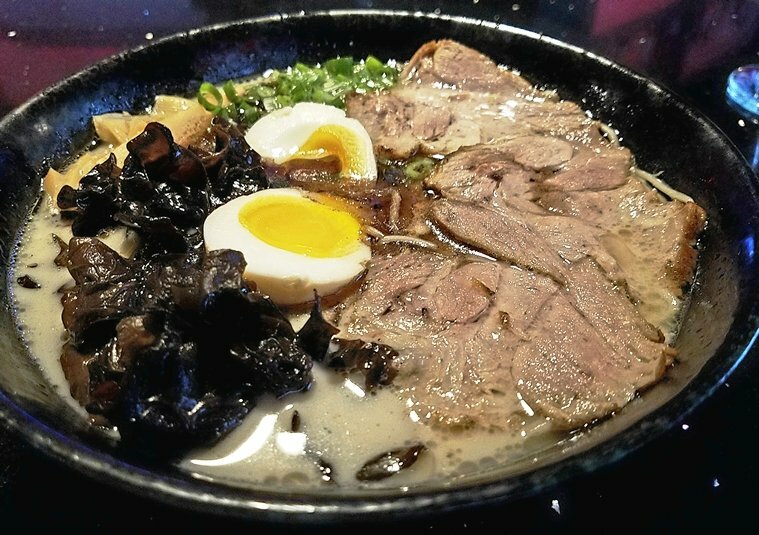 The tonkotsu has a wonderful savory depth to its flavor profile that just pulls you into this delicious meal. And the cha-siu at Sono is tender and sliced nicely thin. Overall you can’t go wrong with the ramens here at Sono so enjoy! But let’s face it, if you’re talking about Sono and Japanese food, you have to try the sushi! During a recent lunch visit, I tried the Dancing Eel and Surf n Turf rolls for lunch (2 for $20) and they were wonderful. Medium-sized they showed off some excellent rice and construction. 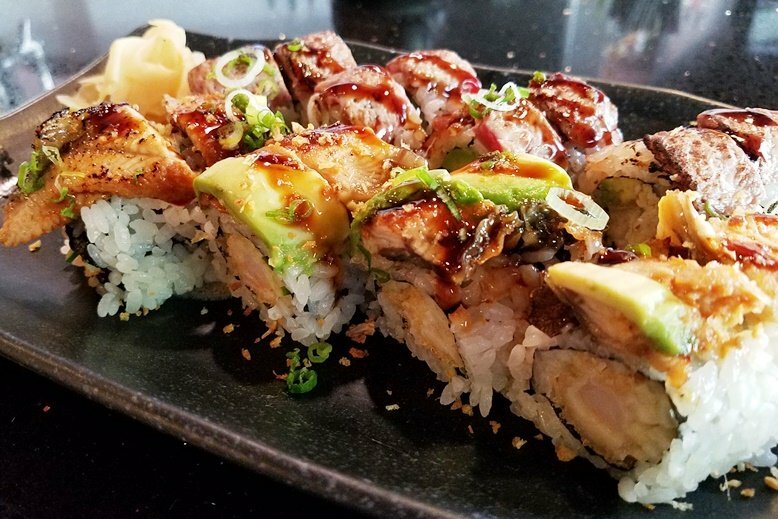 I usually enjoy specialty rolls and Sono does a great job here with excellent ingredients that are allowed to shine with a minimum of sauces. The Surf and Turf roll was topped with tenderized beef and stuffed with tasty crab which really pops out on the palate. And the seared eel on the second roll was deliciously seared and generously applied. 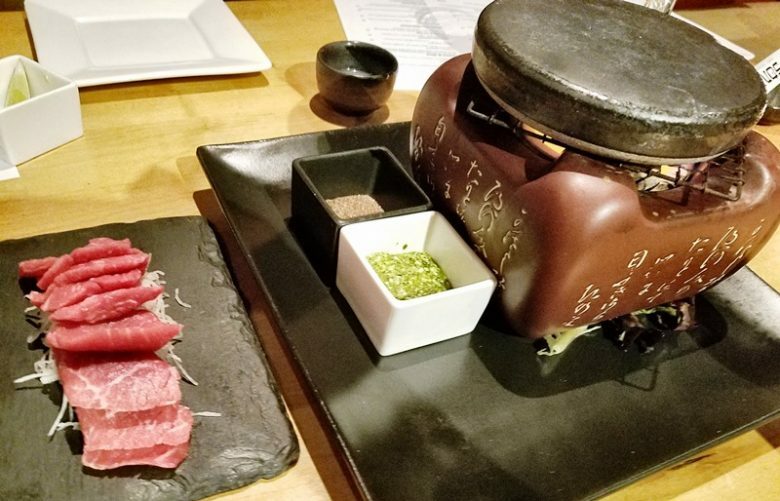 The rest of Sono’s menu is pretty interesting featuring a table-side ishiyaki (grilled beef), Korean fried chicken, hamachi jalapeno and more. 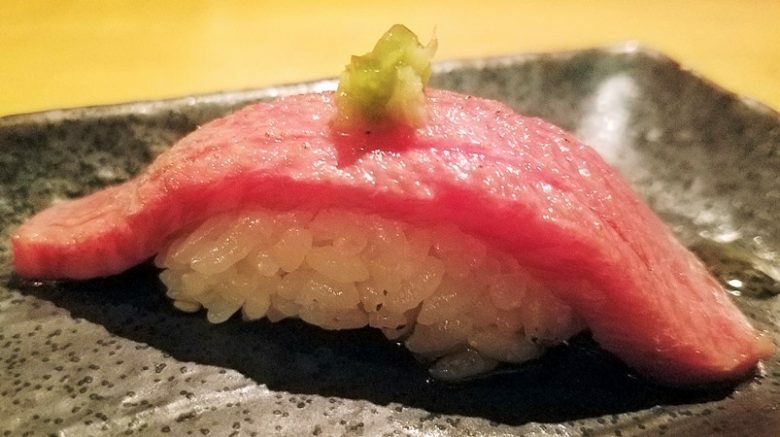 During a media visit, I tried out a sublime starter of Wagyu beef atop sushi rice and topped with some jalapeno, a fantastic treatment of high-quality beef. And Sono also offers an omakase (chef’s choice, coursed meal) which I imagine would be a lot of fun. All I can say is that Sono is in good hands with Chef Kim and I’d trust him in same way I trusted Chef Mike Lee, previously. They’re staying true to their ingredients while offering up some twists in the menu to keep things interesting. They’ve also increased the emphasis on their sakes offering over 35+ options in their program along with a Tuesday night, Wine & Sake social for $10 along with some complimentary sushi. How can you go wrong there?! So thank you Chef Kim and GM James Yang for taking care of one of my favorite downtown Raleigh restaurants. I know you’ll keep up the same great standards that Sono has always had and I’m looking forward to my next meal with y’all!